NEW YORK—An early morning fire in Brooklyn that started after lightning struck the roof of an apartment building escalated into a four-alarm fire that caused minor injuries and displaced about 200 residents, according to authorities. The Brownsville blaze, which started at about 1 a.m. on July 4, sent residents fleeing into the streets as firefighters took axes to the walls to contain the fire. 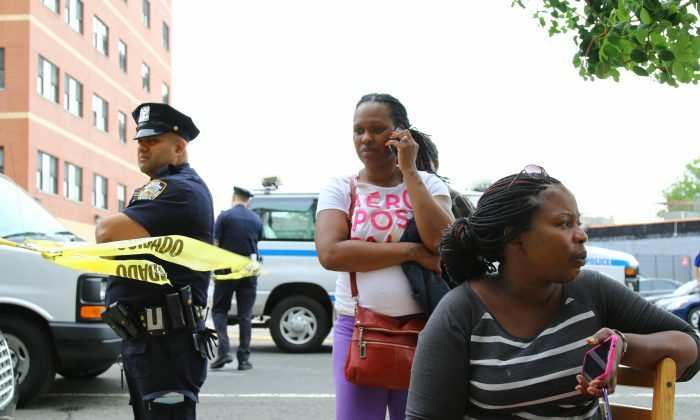 According to the Red Cross of New York City, which was staging disaster relief at a nearby school, 70 units of the building’s 71 were occupied. The top two floors of the six-story building are now uninhabitable. Residents of the building, at 214 Rockaway Parkway, said that they have already endured years of substandard living conditions. Some were ready to leave even before the fire. “Just last night I was talking to my brother in Maryland, saying ‘I need to get out of here,'” said Leslie-Ann Robert Smith, who has lived in the building for almost a decade. “It’s embarrassing to bring people here—there are homeless people inside, people on drugs, they never fix anything. In the years she has lived there, she said things have gone “downhill.” Smith said that there have been several small fires in the building hallways just in the past several months, and the lights are constantly flickering. Sometimes the power just goes off completely. Other displaced residents also said they have long been worried about sparking light sockets, fire inside the walls, and an elevator broken for months on end. Some said repeated attempts to contact the landlord were unsuccessful. “Today is the first time we’ve seen him in God knows how long,” said Holmes. The property, which is owned by Rockaway 154 LLC has 25 open violations, according to the city’s Department of Buildings. By late morning, the Red Cross had already met with over 100 residents, providing food, shelter, and mental health support. Dozens of volunteers gave up their Fourth of July holiday to help the residents. An early estimate is that about 30 households will need help finding a place to stay, according to Red Cross spokesman Michael de Vulpillieres. He said that about 16 units on the top floors have major damage and residents there will not be able to return anytime in the near future. It’s not the first time lightning has caused disaster in the area. Almost exactly two years ago on July 26, 2012, lightning struck the roof of a Prospect Park-Lefferts Garden building, setting off a six-alarm fire. A 25-foot section of the Brooklyn Bridge facade collapsed after a powerful thunder and lightning rainstorm Wednesday evening.